What He Said makes it easy for anyone and everyone to access the teachings of Christ. It presents the portion of the Bible where Jesus speaks—The Four Gospels—in an innovative new layout designed specifically for ease of use. Each quote is prominently displayed, in order, along with the supporting chapter/verse text to provide valuable context. For the devout, it’s the ideal companion to their Bible(s). Small, portable, and perfect for quickly finding favorite quotes and passages. For others, it’s a great reference guide for separating what Christ really taught in the New Testament from a wide spectrum of interpretation. For all, What He Said shines a spotlight on what He said, making His message easy to read, browse, study, and explore. 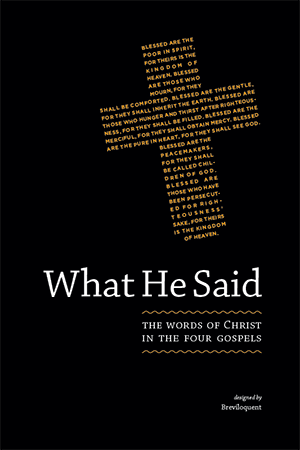 The foundation of What He Said is the Four Gospels as they appear in The World English Bible (WEB), a modern English translation of the Holy Bible. The WEB is based on the American Standard Version (first published in 1901), the Greek Majority Text (New Testament), and the Hebrew Biblia Hebraica Stuttgartensia (Old Testament) and is published without copyright by Rainbow Missions, Inc. This book began with an electronic version of the WEB downloaded from www.ebible.org. Is “Happy Holidays” a Dirty Word (or two)?